Foundation Waterproofing: Why Does It Leak? Pressure problem. Hydrostatic pressure exerted against the foundation forces water to leak in through gaps and cracks in the foundation. Flooding in basements and crawl spaces is common in both old homes and newer homes, and it is rarely a one-time occurrence. Once water has flooded through your foundation, you can be certain that it will happen again. Water intrusion can ruin many parts of your home and create the opportunity for mould to grow. There are two important factors that contribute to basement leaking: the clay bowl effect and hydrostatic pressure. Both have similar damaging effects, which is why it's important to be aware of the proper way to waterproof your foundation. To learn more about what we can do to help you with foundation cracks and waterproofing, call us today! 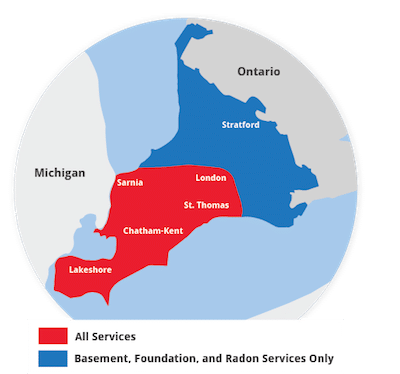 Our services are available in London, Windsor, Chatham, Sarnia and throughout ON. Backfill soil is porous. Excavated soil that's replaced around a completed foundation isn't as dense and tightly packed as undisturbed soil farther away. As a result, water collects in the soil immediately surrounding the house, putting pressure on foundation walls -the Clay Bowl Effect. More pressure = more leakage. However, at Advanced Basement Systems, we have an approach to solving water problems of all types. Our solutions cover all surfaces of the basement, including the foundation walls, basement floors, and even wet crawl spaces. We offer free basement waterproofing estimates in Ontario, including Ingersoll, Kingsville, Aylmer, Goderich, Hanover, Listowel and many areas nearby. Contact us today to get started!